J-Head Nozzles: The Original Mk IV Prototype Prints! The Original Mk IV Prototype Prints! The original Mk IV prototype was built with a new, vented, nozzle holder in order to help cool the liner. The goal of the new nozzle holder was to eliminate the heat-sink used in the Mk III-B. 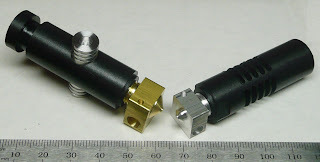 The nozzle/heater unit was made with a 1/2" x 1/2" (13mm x 13mm) piece of 2024 aluminum bar stock as opposed to the 5/8" x 1/2" (16mm x 13mm) brass bar stock that is normally used. Since a 6.8 ohm resistor has a smaller diameter than the 5.6 ohm resistor, the 6.8 ohm resistor was used. The biggest change, however, is that the PTFE sleeve doesn't go all the way to the tip as with the earlier design. Due to the smaller size, there wasn't enough room so a compromise had to be made. The PTFE sleeve now stops slightly above the heater resistor and the filament is in direct contact with the aluminum from there to the tip. Even though the test results, of the smaller nozzle/heater unit are positive, I am not going to use move to the smaller design at this time. Instead, the Mk IV will use the tried and proven earlier nozzle/heater unit with a vented nozzle holder. I will, however, continue testing and improving the smaller nozzle/heater unit and plan on making it part of the Mk V.